Pho with rare beef, well-done brisket, and beef tendon at Pho 87. 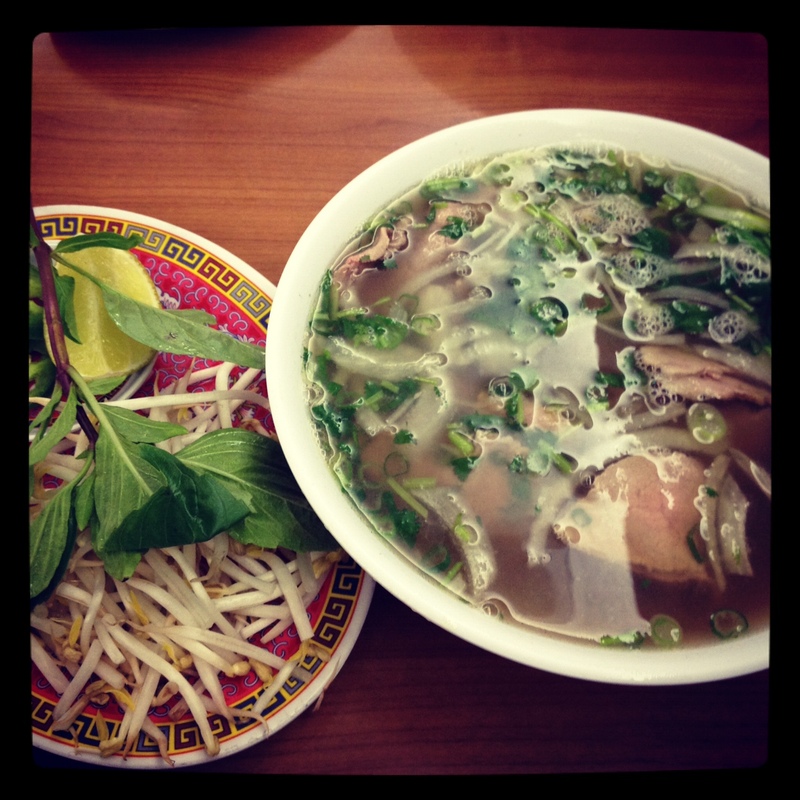 Pho 87 is our go-to place for pho now. It’s located in Chinatown, which is where the other two pho shops I’ve been to so far are also located (Gigo’s and Via). Does anyone know if there’s a Viet town in/around LA? Anyway, back to this pho. The broth is out of control good. Really deep and delicious flavors created magically from cooking it for hours and hours. The kind of broth you don’t want to muck up with sriacha and hoisin. R got a medium Pho Tai (with rare beef) and I got a small I-forget-the-name-but-I-think-it’s-number-5 (with rare beef, well-done brisket, and tendon). This is my new favorite pho. I used to always order the super combination one with tripe, meatballs, tendon, and other bits, but lately the offal in Asian soups has been a little too much even for me. The beef and tendon one is perfect. Tendon, when prepared properly, is rich like fat but without the fat and has a great texture. I remember being told that it’s good for your skin, but that might be an old wives’ Asian moms’ tale. The pho at Pho 87 is delicious and very reasonably priced at around $7.50. Cash only. Bonus: They were playing the game, so we watched the second quarter there. Sadly, it was the only part of the game I actually saw because we don’t have cable, but we listened to it streaming live. Sweet R woke me up from a desperately needed nap so I could listen to the last part of the game just in time to hear our boys win. Question: Does anyone know why so many pho shops are called Pho # (e.g., Pho 75, Pho 87, etc.)? Someone told me once it signified the year the owners emigrated to America.